I’ve also added a little bit of color and texture to my center facing sofas. Since these couches are totally different in style and color from one another, I try to bring them together by balancing color and texture in the pillows. On the gray West Elm Henry sofa, I’ve got a couple of indigo pillows a friend gave me a few years ago, a shot of green from a lumbar pillow from Stuck on Hue, and a blue and cream kilim pillow from Antique Tex. I am in love with the design and colors on this Kilim! 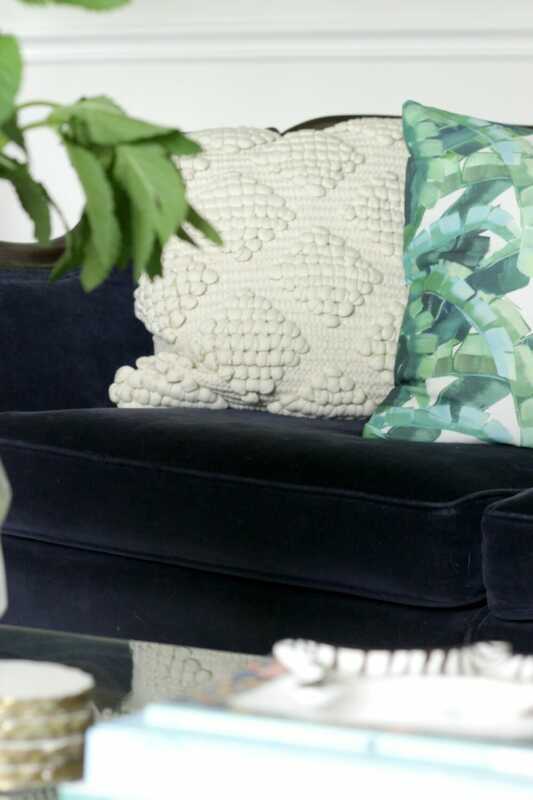 On the opposing navy vintage velvet sofa, I’ve used Shelby Dillon’s banana leaf pillows in a vibrant tropical green with hints of teal. I’ve paired them with a couple of textured cream and gray pillows from Antique Tex. The texture of this one has that boho summery vibe, but it will easily transition through every season. The cream lumbar pillow from Antique Tex has an embroidered gray design and my favorite thing… pom pom corners! 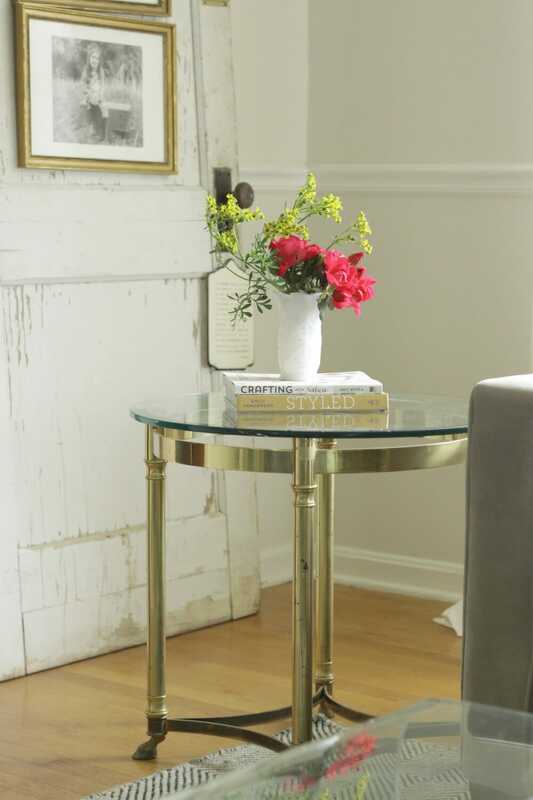 You may have noticed the greenery on the coffee table. Have you ever planted sweet mint? If you do, do yourself a favor and plant it in a place where you want it to just go wild and cover all the things… do not plant it in, say, a pretty garden with lots of flowers you love. Whoops. Well, I put my overgrowth of mint to use and collected it in a large vase on the coffee table. Bonus- it smells amazing! I also added my constellation Mova globe because it reminds me of one of our favorite summertime activities… stargazing! I always keep a few of my favorite design books in the living room because they look lovely and give people something fun to peruse. 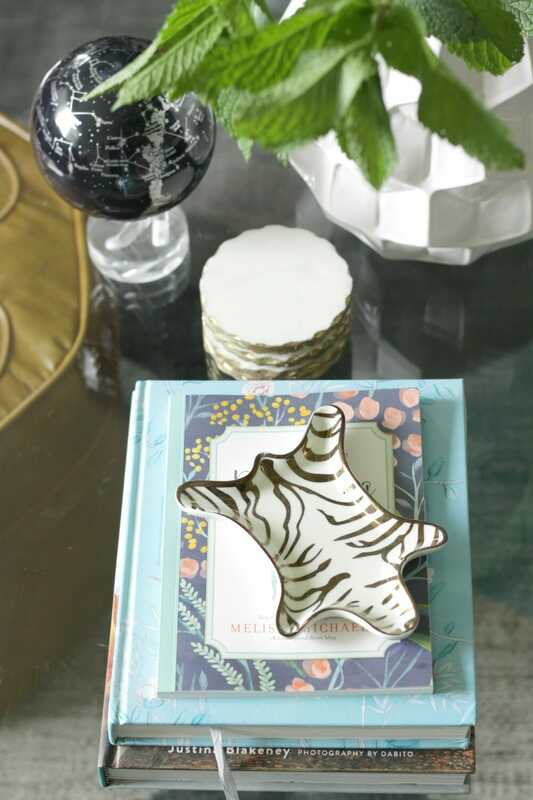 I found the coasters a couple of years ago at TJ Maxx, and the zebra dish was a gift from a friend. I also clipped some blooms from our knockout rose which is flowering like crazy. I placed them in a small vase with some yellow rue on a side table. The rue is supposed to help keep bugs from eating the roses…. I am not sure how effective it is, but our roses are thriving, so maybe it has to do with them? The rue has grown enormous and needed some trimming, so I thought I’d put it to use and it’s quite fragrant as well. It’s quite honestly not the prettiest of bouquets, but it’s simple, and this is the seasonal simplicity tour. 😉 And there’s really nothing better than being able to clip stems from your own garden. Our mantle is always one of my favorite places to show signs of the season. 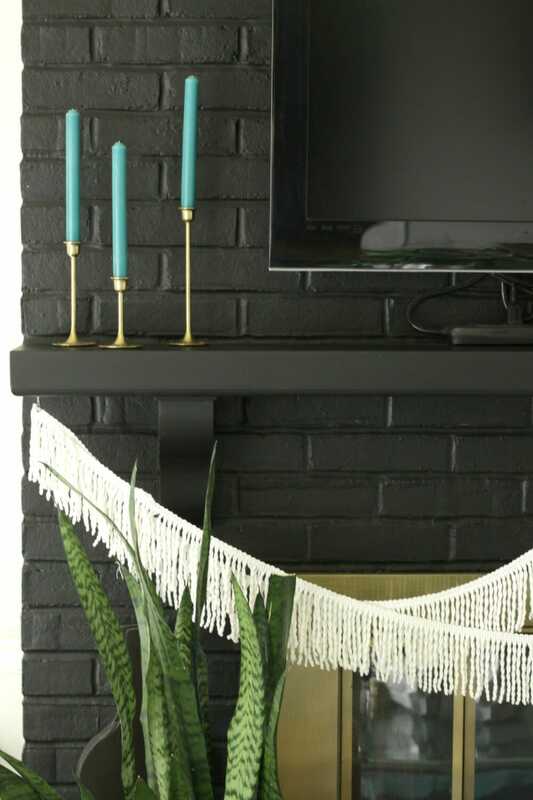 Fittingly for this tour this year, I kept it super simple by just lining up some of my midcentury brass candlesticks with teal candles on the mantle. 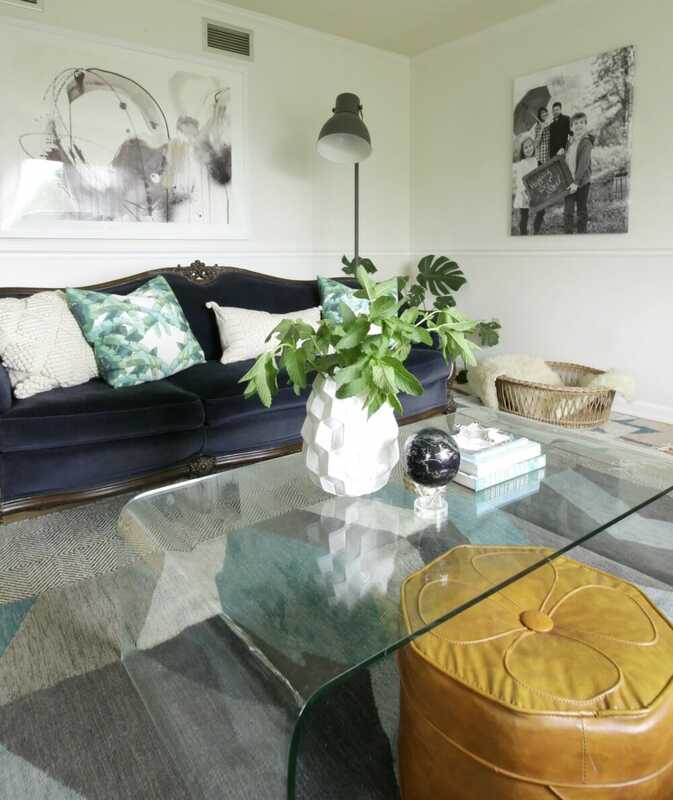 The teal pops against the black, has a subtle beachy vibe, and works beautifully with the new rug which really brings the room together. 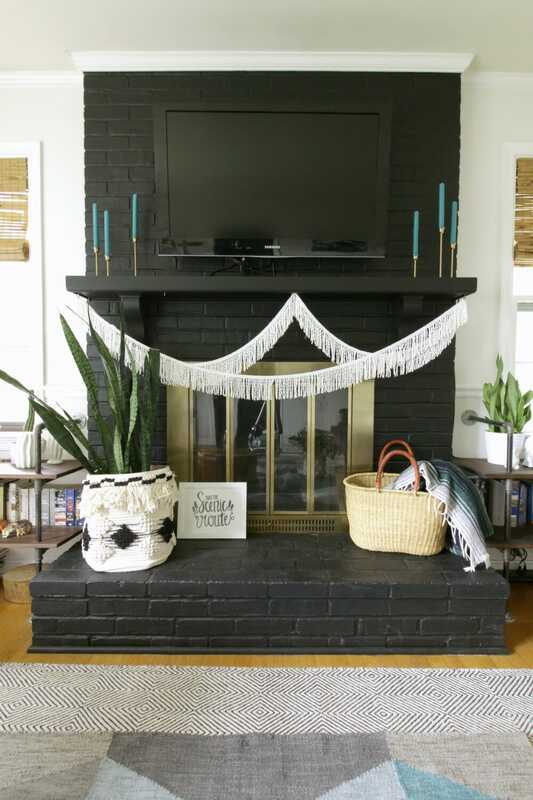 The fringe is now going on two years strong on the mantle… Not over it yet! Somewhere in the “home blogger’s guidebook” there’s a rule about keeping a decoration up for that long, but rules were made to be broken and I like to live on the edge. My snake plant has been sitting on the hearth for a bit now, and I’ve always HATED the black pot I had it in, but it’s hard to find inexpensive large pretty pots, isn’t it? 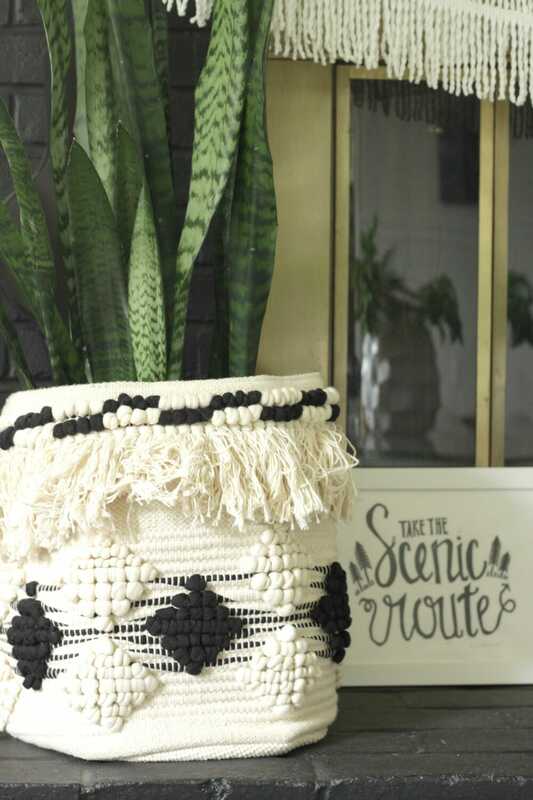 This new moroccan basket from Antique Tex masks the plastic pot beautifully and brings in that modern bohemian style I love. I also added a little “Take the Scenic Route” Print as Summer is the perfect time to do that… slow down, take it easy, and enjoy the ride. We’ll certainly be road tripping a bit this Summer! We’ve made one other change to this room … we removed the turquoise dresser that sat under the family photo! You” have to come back tomorrow to see where it landed, but for now I’ve added a vintage dog basket I found at an auction with a sheepskin (my dogs love laying on these). Under the dog bed, I added a Kilim throw rug from Antique Tex to protect the floor from scratching. It mirrors the pattern of the kilim pillow. As promised, I kept it very simple with seasonal touches in my living room this year. Tomorrow I will be sharing my kitchen and dining room, which are a little more “Summery” at the moment, but decorated using only items I already owned. Come back and check it out then! If you like what you saw today, you can shop this look at the very bottom of this post. 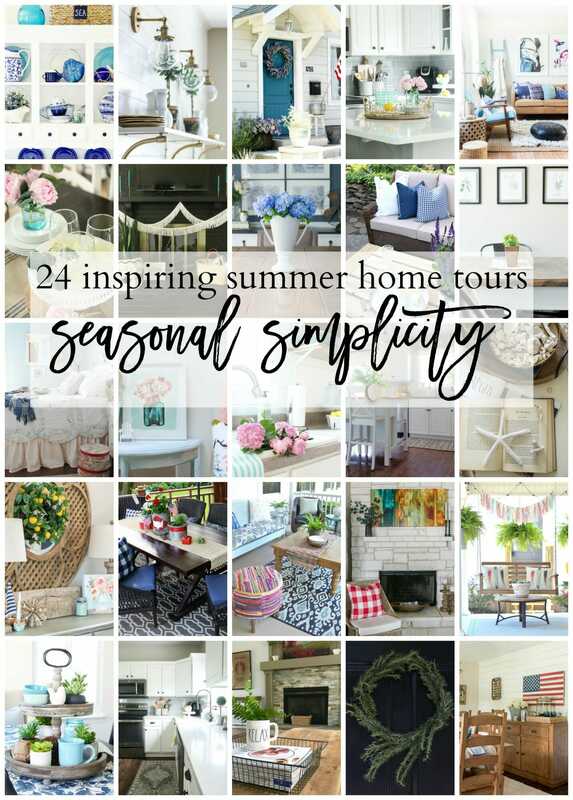 Now head on over to Jaime’s blog, That’s My Letter, to see her Seasonal Simplicity Tour in her gorgeous old northern farmhouse, and make sure you visit all of the other Seasonal Simplicity tours today and throughout the week. Cassie I still love your black fireplace and vividly remember you painting that. And now you’ve convinced me I need more clipped flowers and plants in my life. So pretty. 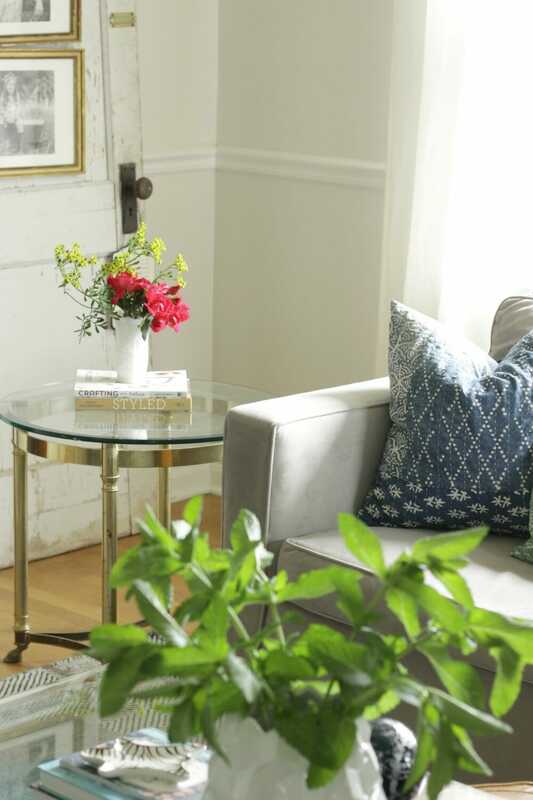 Cassie, your home is chock-full of so many beautiful textures! 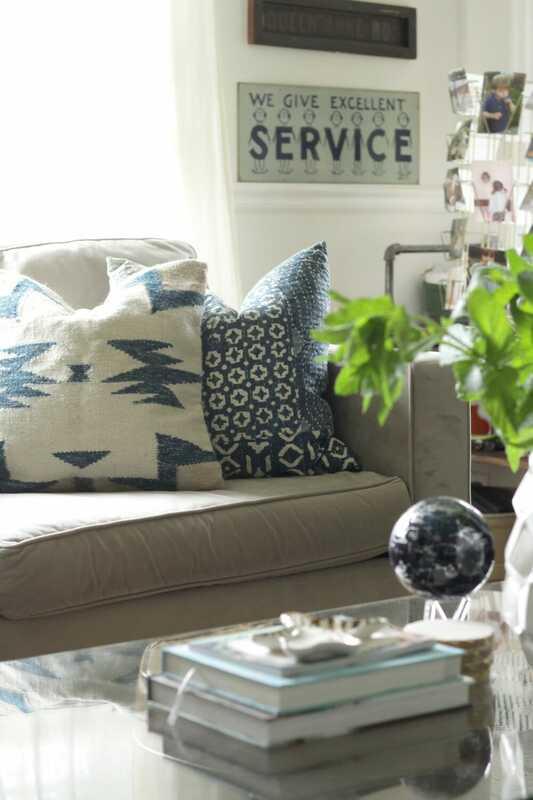 I love the little boho pillow and that kilim! Gorgeous. Love the way you marry the two different sofas and that rug rocks! Plus you have the world’s cutest dog bed! I love it so so much. 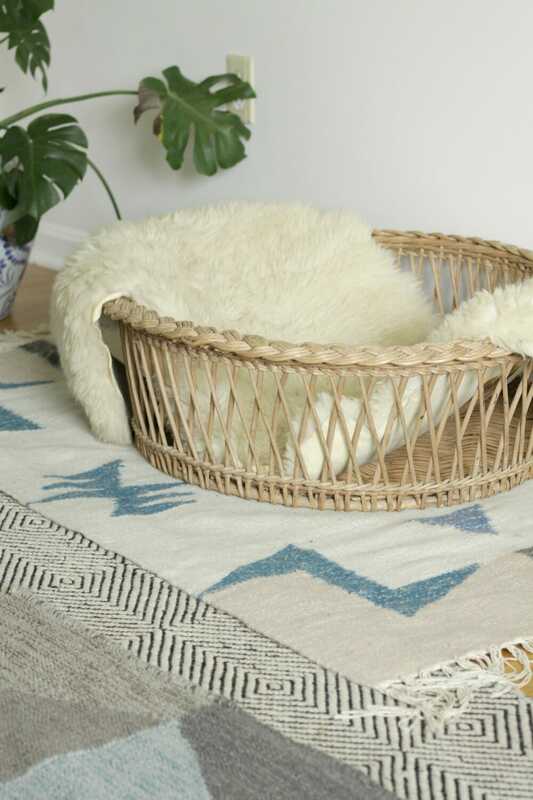 The dog bed is so awesome and stylish and I must have that moroccan basket. Seriously love! isn’t that moroccan basket awesome?!?! i love it! What a beautiful space, and I am IN LOVE with that velvet sofa! Love, love, love it! I love how this room has come together and how light and bright it is!! Beautiful as always! The new rug looks so pretty in your living room! Very “you.” Such a pretty room! Fabulous tour, Cassie! I love that rug!! So stunning. And your summer pillows are perfect! thank you so much, krista- thank you also for hosting and including me! Absolutely beautiful! I really love the rug in there. thank you, ashley! isn’t that rug amazing?!? I’ve got mint that’s taking over a flower garden too! I’ve got to figure out how to get it under control. I love the summer updates! you clearly need to cut it and put it in vases EVERYWHERE! 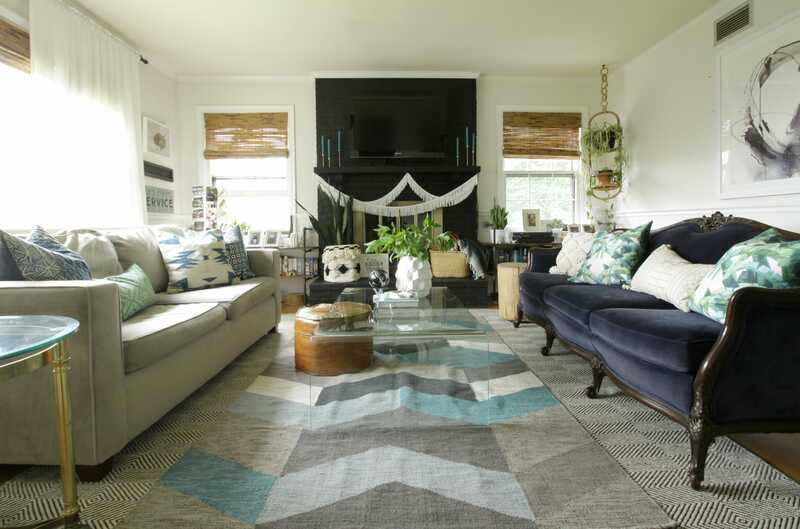 The rug layering and teal touches are perfect! The plant basket and pillows are great too! I did the same with fresh clippings from the yard for some “summery” touches. thank you, april! and thank you for hosting and including me! Love that rug and all those pretty pillows!!? 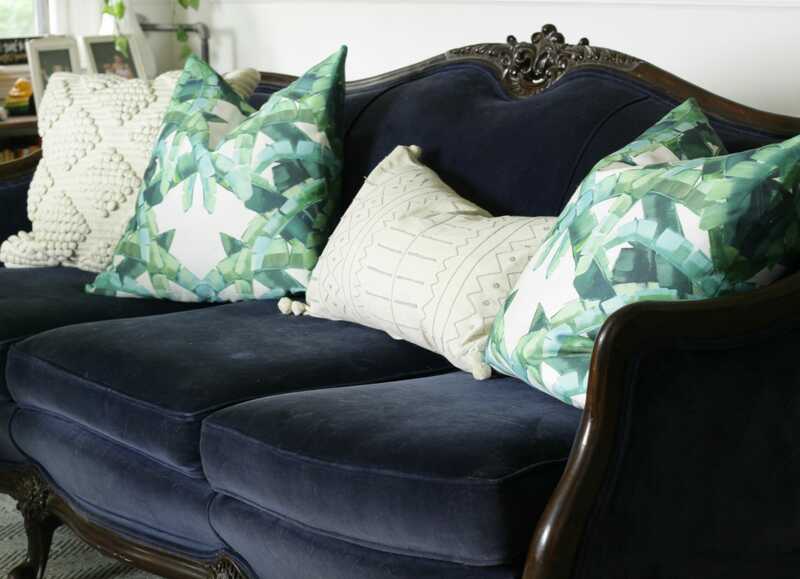 Your navy velvet sofa is to-die-for! I love that piece of furniture. I also love your choices in pillows! So pretty! 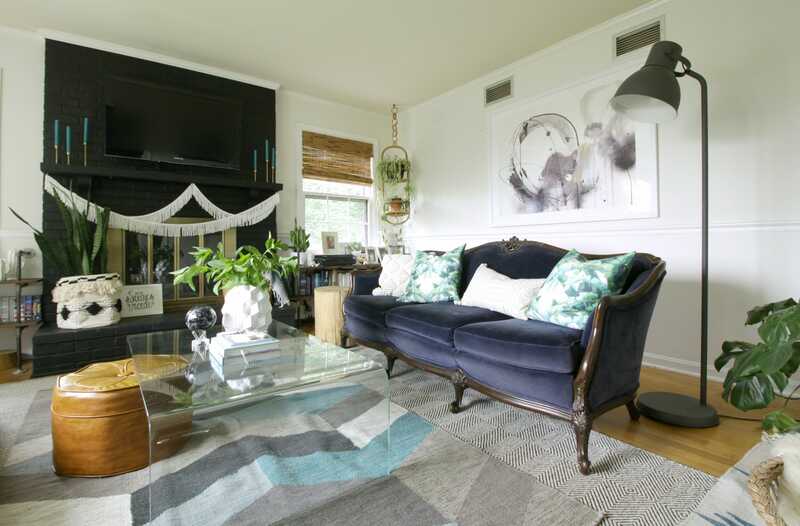 I love the eclectic look of your space, Cassie! And of course I’m swooning over all of the teal! 🙂 It was so fun being “on tour” with you this week! I want to steal every one of your pillows and that rug! You always find the best textiles! Love it all! 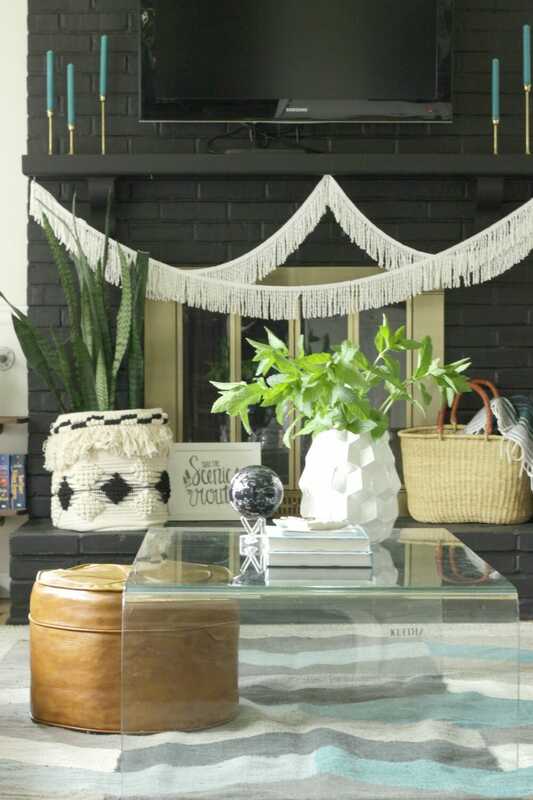 Love your layered rugs and fresh boho style. Your colorful throw pillows are gorgeous! This room just keeps getting better and better!! 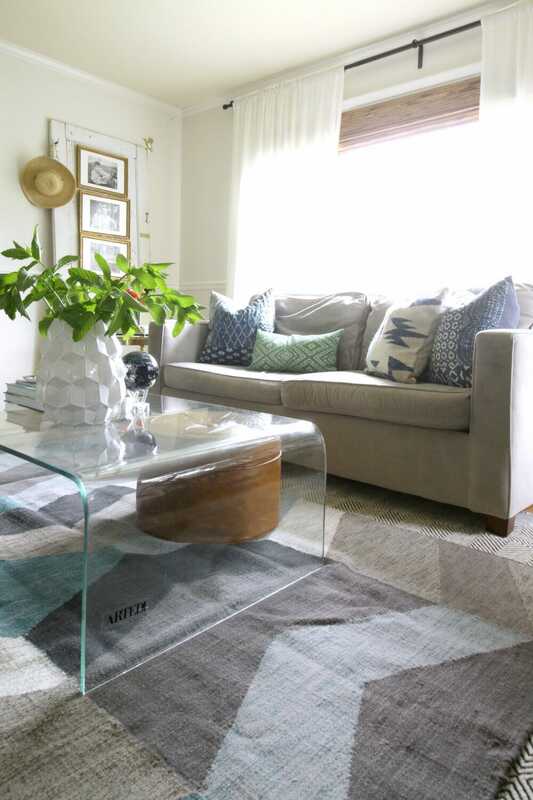 LOVE the new rug and the pillows on your gray sofa. I want them all!! Gorgeous! thank you so much, jessica! the rug makes me so happy!